North London joiners and woodworkers, specialising in traditionally made replacement windows and doors. The rising cost of heating means more and more people are concerned about their carbon footprint and the loss of heat through their windows. Wood is an excellent insulating material but badly fitting old windows can lose a lot of heat. 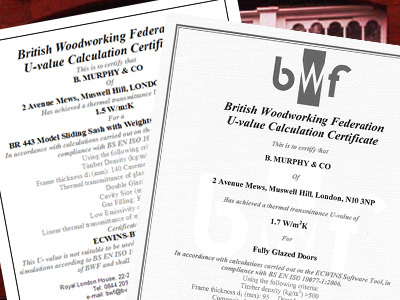 U-value of between 1.1 and 1.7 depending on the type of window, (in this instance the lower the number the better), and therefore comply with the latest Document L Building Regulations. These figures are not only dependent on the quality of build and draught-proofing but also on the type of glazing used. A popular choice are Planitherm Double glazed units filled with Krypton Gas. We also offer Planitherm Plus, Triple glazed and Xenon filled units, all made to measure. Please contact us to find out more about their respective merits. Small pane windows can be reproduced using larger panes with internal dividers and Coloured and Leaded Lights can be replicated or incorporated into the double glazed unit.